Didja hear? Bobby C's back in town! 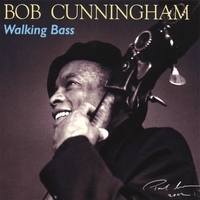 Actually, bassist Bob Cunningham has always been around, but his first and only album as a leader, Walking Bass , has been released for the first time on CD. Originally recorded in 1985, it features the late, great Bross Townsend on piano and Melvin Sparks (Hassan) on guitar, with Alvin Queen and Bernard Purdie sharing drumming duties. The title cut opens the disc and is Cunningham's spin on a humorous jazz poem written by Keeter Betts. While Cunningham's amplified singing voice is average, his plucking is authoritative and spry, producing deep, round tones. If "Walking Bass" flirts with rap, Cunningham's arrangement of mentor Dizzy Gillespie's "Manteca" goes there headlong. This version of the Afro-Cuban classic, featuring excellent piano playing by Townsend and a blistering arco solo by Cunningham, includes a tongue-in-cheek rap homage to Diz, especially fitting since Gillespie was one of the founding fathers of bebop, a musical genre which, like rap, profoundly changed the landscape of world music and culture. "Blues for Basie" is a juke joint delight, with Cunningham wailing over sparkling riffs by Townsend and solid drumming by Queen. Cunningham's bow sings like a horn on "Mama's House," and "D'Andrea" finds Cunningham overdubbed on synthesizer and bass, with Townsend contributing an absolutely brilliant solo. "Lover's Theme" features Cunningham wailing on arco like a free jazz saxophonist as Townsend and Queen function as dual timekeepers, and the group gives "A Night In Tunisia" an R&B/funk groove. Whether he's playing originals or covering classics, going pizzicato or bowing like a buzzsaw, Bob Cunningham and his band hit all the right notes. Let's hope that we don't have to wait another 19 years for his next release. Visit Bob Cunningham on the web. Personnel: Bob Cunningham: bass; Bross Townsend: piano; Melvin Sparks Hassan on guitar; Alvin Queen and Bernard Purdie: drums.